Today I want to share a book with you that we have read this week. 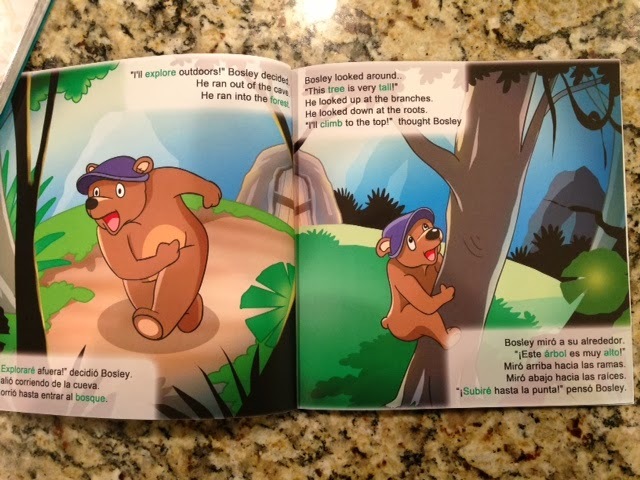 Tim Johnson from The Language Bear contacted me and asked me to review the book "Bosley Sees the World". 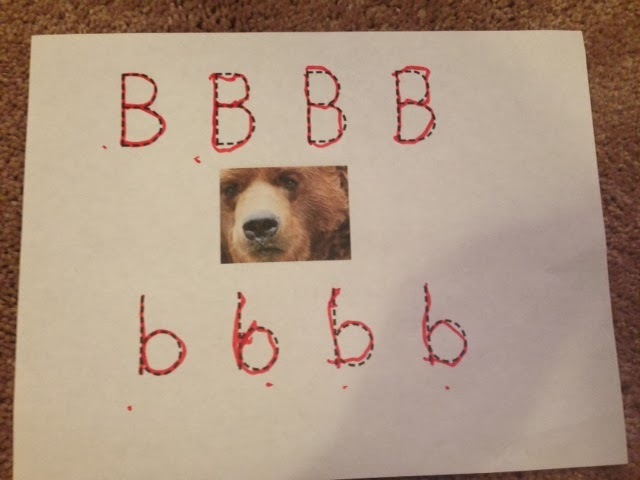 It worked out perfectly since we have been working on the letter Bb for bear. 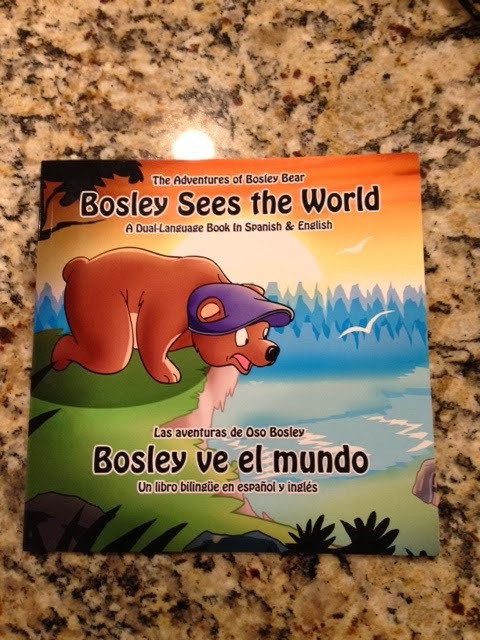 Follow Bosley Bear as he discovers how big the world is and how much there is to explore and learn. Bosley is a confident and curious little bear who looks for new challenges around every corner. 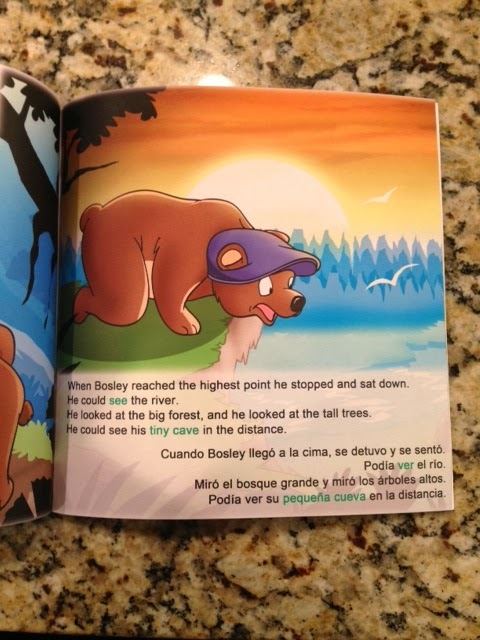 This is a dual language book that is designed to teach your child new words and phrases. The teaching methods used in this book allow children to learn at their own pace and enjoy the learning process. 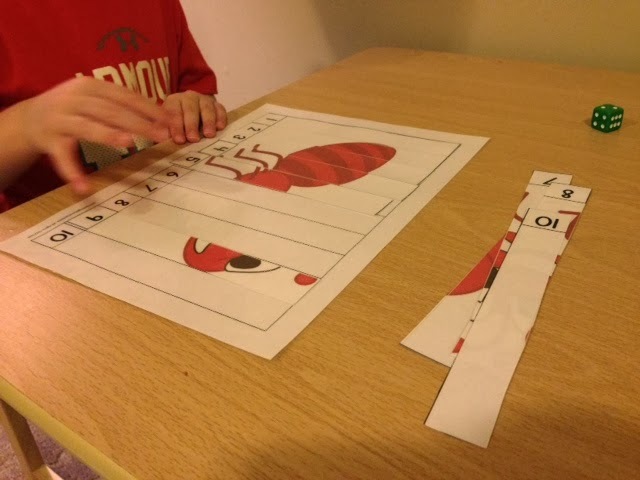 These methods include: repeat words, simple phrases, opposites, highlighted vocabulary words, contextual learning, and corresponding imagery. This book is a dual language book and is available in Spanish, German, Italian, French, Portuguese, Russian, Chinese, Japanese, Arabic, and Hindi. All of them provide line-by-line translations in English and the second language. This is a very cute story about an adventurous Bosley who wants to explore the world around him - all children can relate to that, right? The illustrations are bright, colorful, and appealing to the eyes. Throughout the text you will see green highlighted vocabulary words. 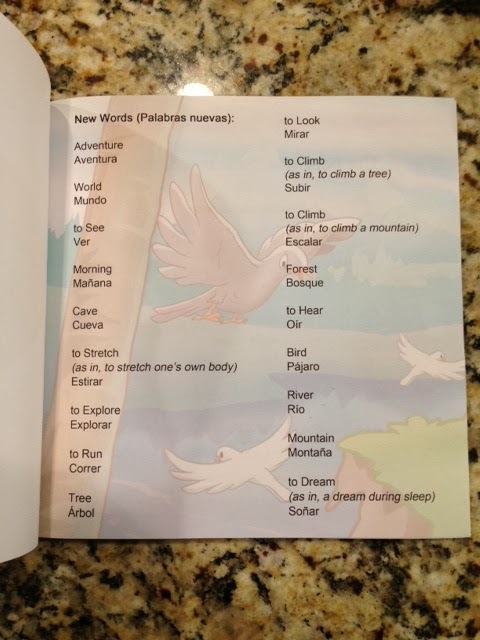 At the back of the book, there is a "New Words" section that shows the both translations of the vocabulary words. In my previous school, we did not have many learners who spoke a different language. All of my students spoke English. 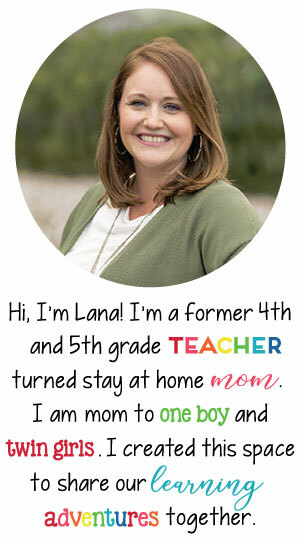 I did have one student once whose father spoke Spanish and a little English, but the child spoke English and only some Spanish. I picked out the English/Spanish version of the text because in the area that I am now in, I think it may be the most useful for me in the future. If you had learners who spoke English as a second language - or had parents who spoke little English - this book would be great! I imagine that with my previous student whose father spoke mostly Spanish, reading to the child at home might be difficult. This dual language book would be great to help encourage reading at home, even if English is the second language. Or - if you have a new student who speaks English as second language - this book might help them feel more confident and be able to enjoy reading with his/her classmates. This week we read the story and E seemed to really enjoy it. Even though he's Pre-K aged - this book would be suitable for older students. Overall - I would definitely recommend "Bosley Sees the World"! Last week we learned about Aa for ants and this week are continuing our learning of Bb for bears. E realized these two were in ABC order and now he says we HAVE to go in ABC order! He's all about having things in order, matching, or sorted correctly so I'm not too surprised. I told him we can go in ANY order and it doesn't matter if it's ABC, but he's set on going in ABC order so next week, the letter C it is! Anyway, let's look at some more of our Letter Bb fun. I ordered counting bears on Amazon and E has LOVED playing with them! We used Do-a-Dot markers to mark the letter Bb on this chart! He did great with this activity. 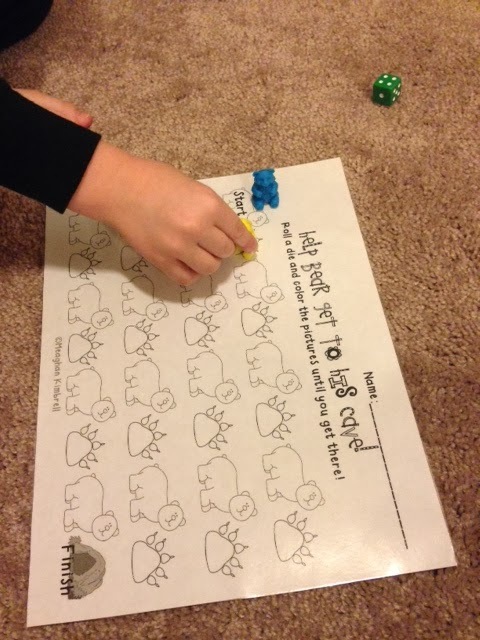 We used the counting bears to play the game "Help the Bear get to his Cave". We each picked a bear and rolled the dice. The goal was to get to your bear to the cave first. E may or may not have had a complete meltdown when my bear got their first. Oops. He won one round, too! 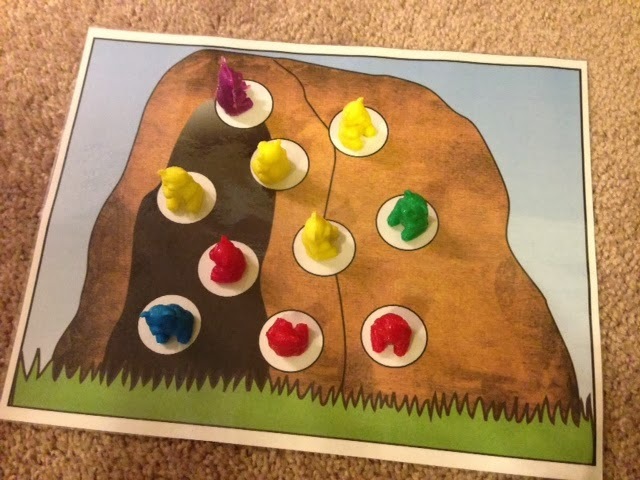 We also used counting bears to add bears to the cave. Super simple - just roll the dice and add that number of bears to the cave. 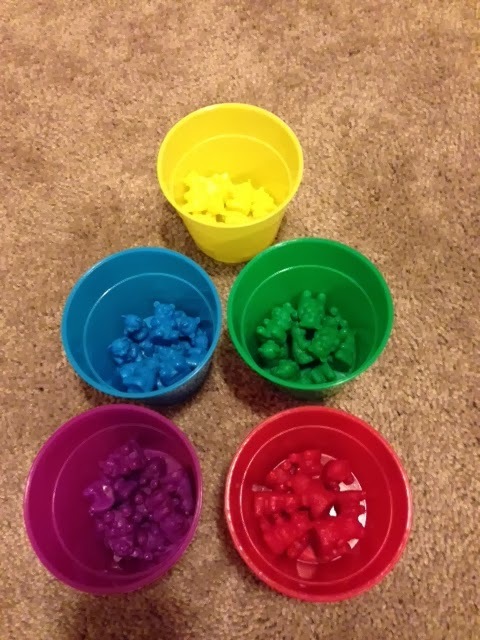 One of our favorite activity was working with gummy bears!! 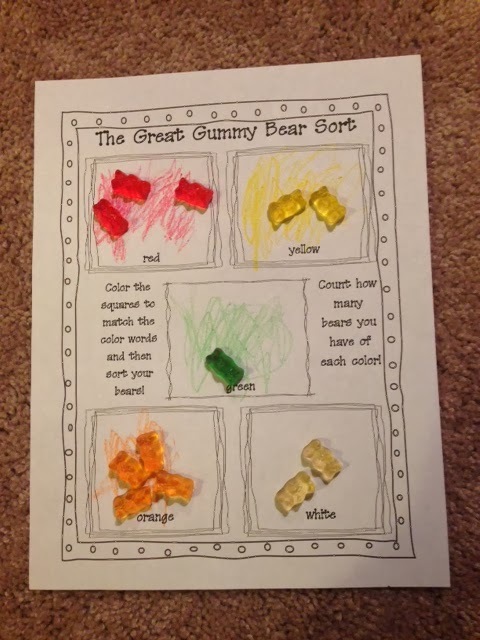 First, we did this Great Gummy Bear Sort, which was SUPER cute and fun! 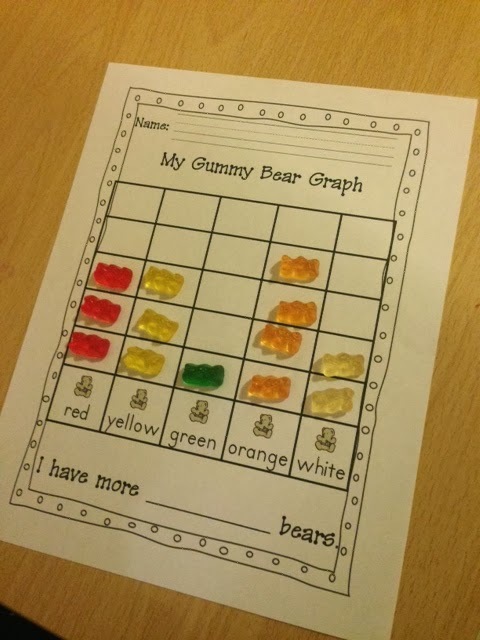 Then, we graphed our gummy bears and talked about which one we had the most of, the least of, etc. 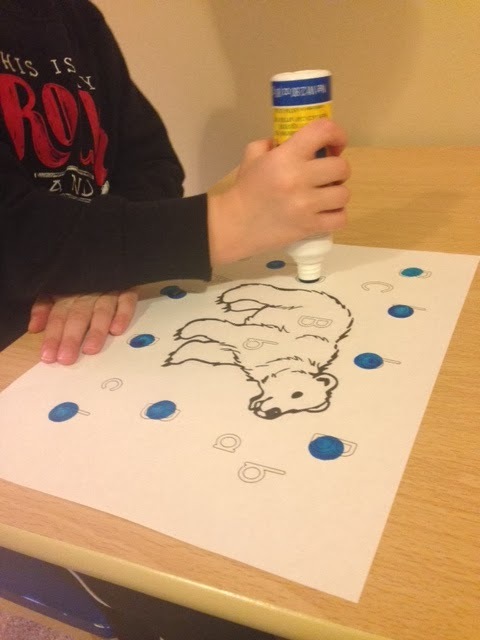 We also did a bear alphabet recognition activity where I would call out a letter and E would color the bear with that letter. What a great way to assess alphabet recognition. We also practiced tracing the letter Bb! 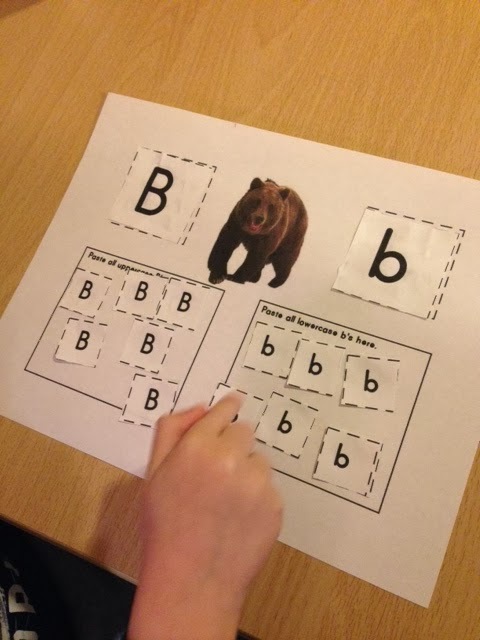 This week we are working on the letter Bb for BEARS! E picked out this theme last week so we were able to go to the library and get a few bear books (the two in the back of this photo). We couldn't find any nonfiction bear books in the kids section so most of our bear books are fiction, but we are still enjoying them! 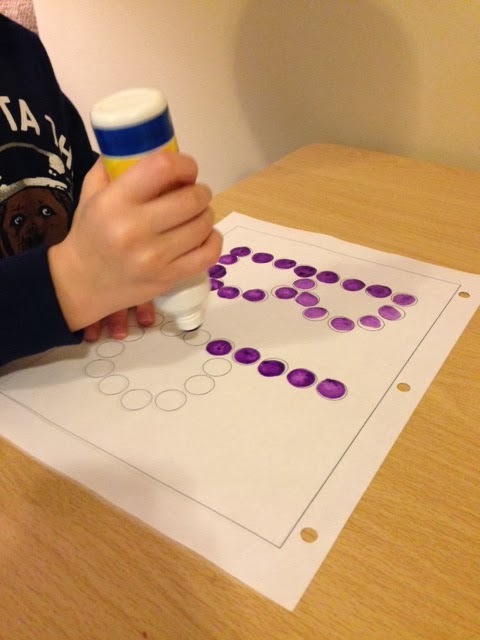 We started off with one of E's favorite activities: Do-a-Dot markers! I cut out the letter Bb's and E glued them and sorted them by uppercase and lowercase. 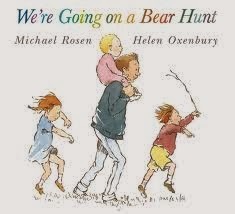 We have watched a YouTube video of the "We're Going on a Bear Hunt" book. We don't have this book, but I am adding it to a list for us to buy and/or check out from the library! What I love about this one is that it's not scary. We've watched other bear hunt videos on YouTube that have scared E. Like him hiding when it got to the bear part. This one was super cute, though. 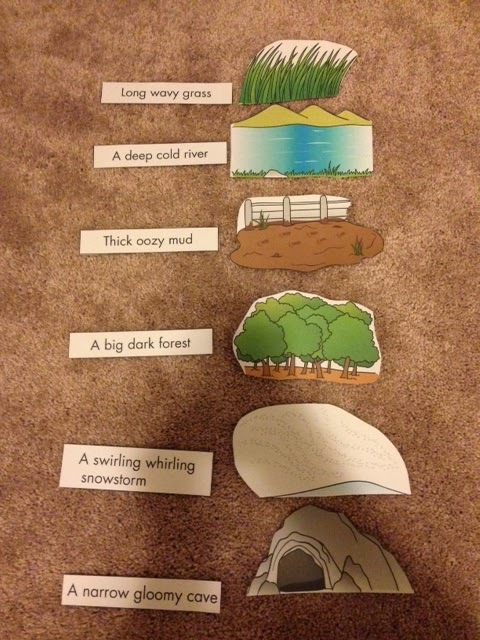 I found these picture story sequence cards that we used while watching the video. I loved these cards! Super cute. I put the words with the pictures ahead of time (scattered at first) so although E can't read, he can easily place the phrase with the picture card. We also matched shapes and talked about what they were. 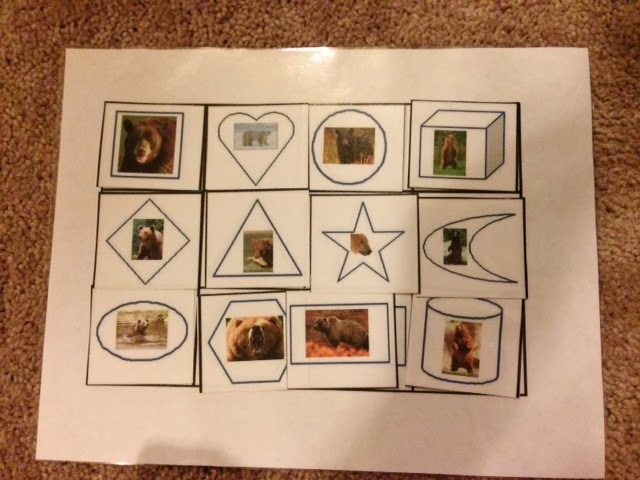 Each shape had a bear picture on it. 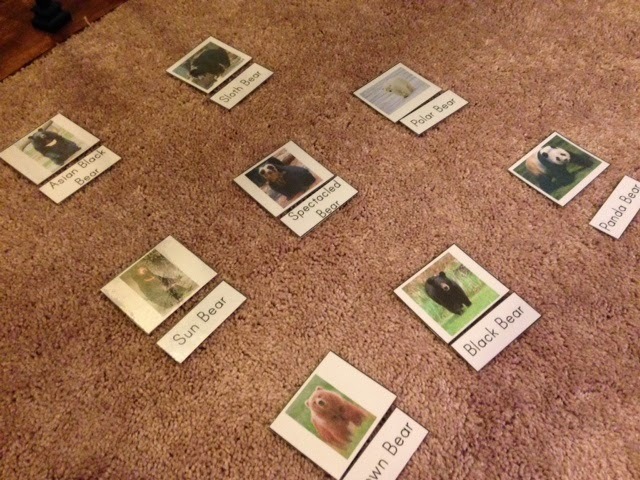 For our last activity, I put pictures of different types of bears out and would call out a type of bear (such as "polar bear") and would give E that card to place under the bear picture. I'll be totally honest - I had to Google some of these! Oops! 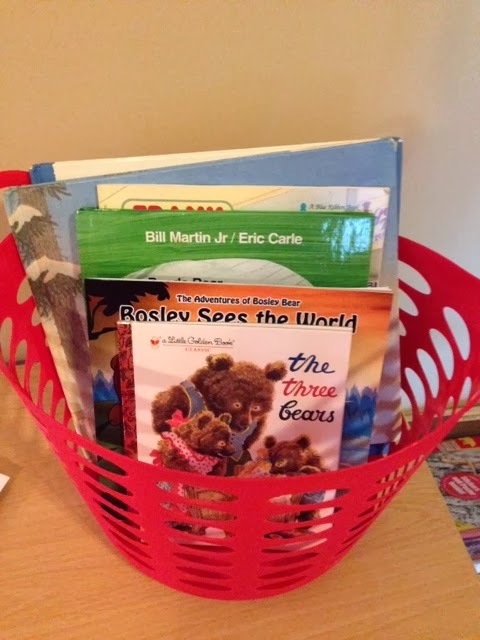 Stay tuned for more Letter Bb - BEARS fun we will do this week, plus a review of a book whose main character is a bear! Several months ago I was contacted by Scott from Bouncy Bands about reviewing his product. Bouncy Bands are a product created out of PVC pipes and bicycle inner tubes. 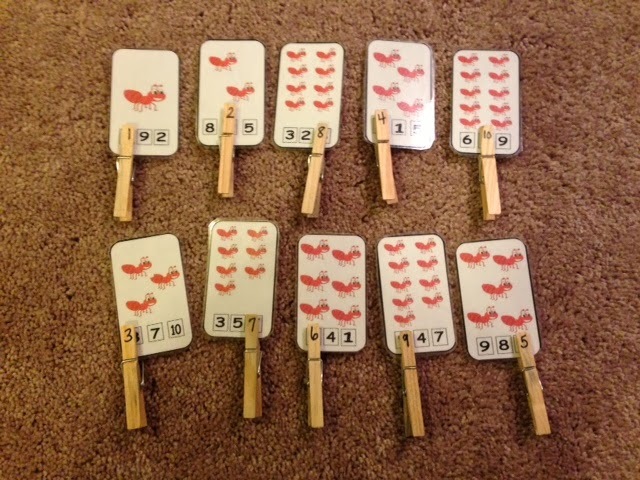 They are placed on a student's desk and allow for movement from the student. It's a great product for children with ADHD, but it's made for any student. I can imagine how every student would want one on their desk! As we teachers know, movement is necessary for students with ADHD. Bouncy Bands provides them with the freedom to move without disrupting class. The Bouncy Band website has great photos and a F.A.Q. page that has a lot of good information on it. "The bouncy bands work great. They are easy to tie on, no slipping, and would give the student just enough movement as needed and would not be distracting". 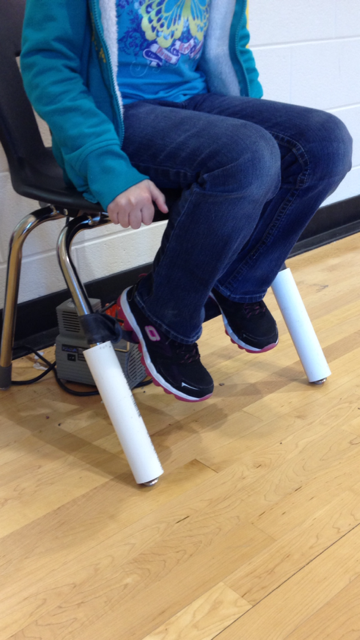 She didn't have a desk in her gymnasium so she used a student chair and it worked out great! A class set of Bouncy Bands are affordable from the Bouncy Bands website. However, if you were on a limited budget, you could even make your own! Scott's website gives instructions on what materials you need and how to use them. 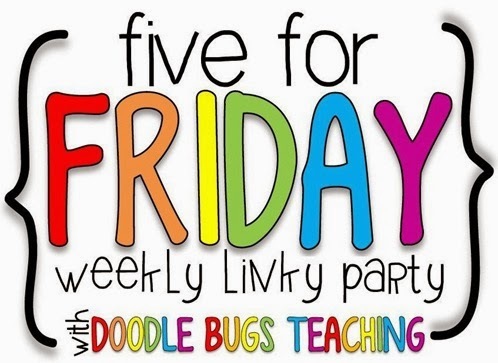 I will definitely be giving them a try in my next classroom! 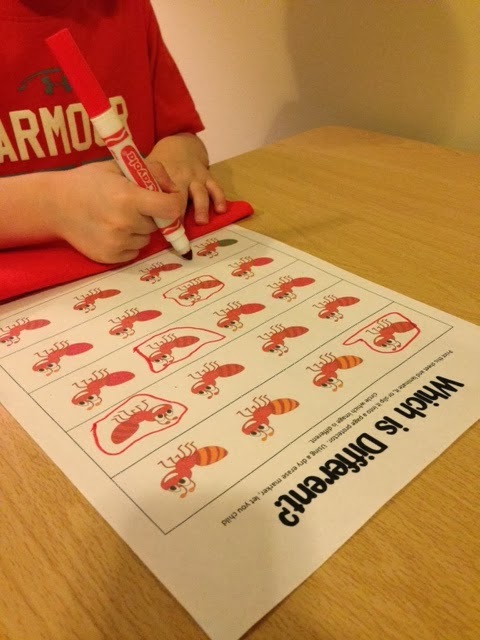 This week I have posted all about our Letter Aa for ANTS fun we have been having! If you missed my first two posts, you can click here and here. Today we have wrapped up our ANT fun! 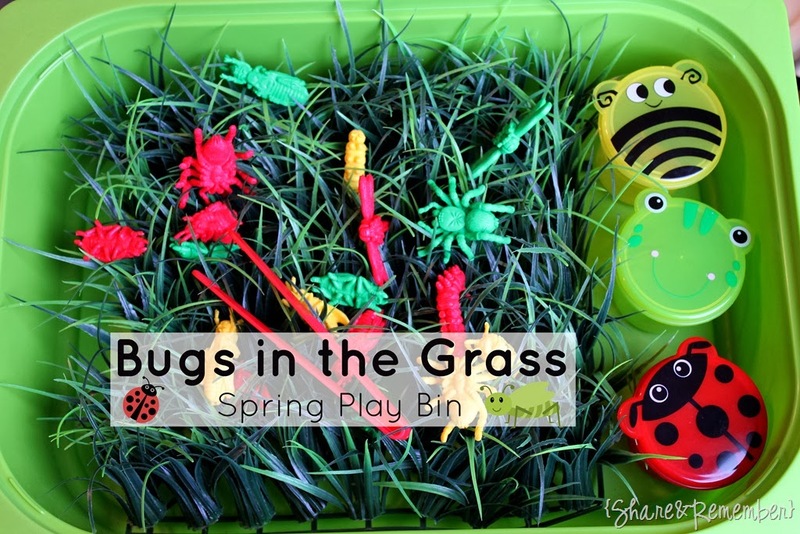 I created this Bugs in the Grass activity after seeing an awesome post on Teach Preschool Facebook page. They linked back to a blog called Share and Remember, where this activity comes from! Hers looks a lot better with more realistic grass and little colored bins to sort the bugs. But, I am happy how mine turned out considering I threw it together in minutes! I love how she had colored cups that they used to sort the bugs with! We continued to practice the letter A and colored an ant, while talking about the parts of the ant! 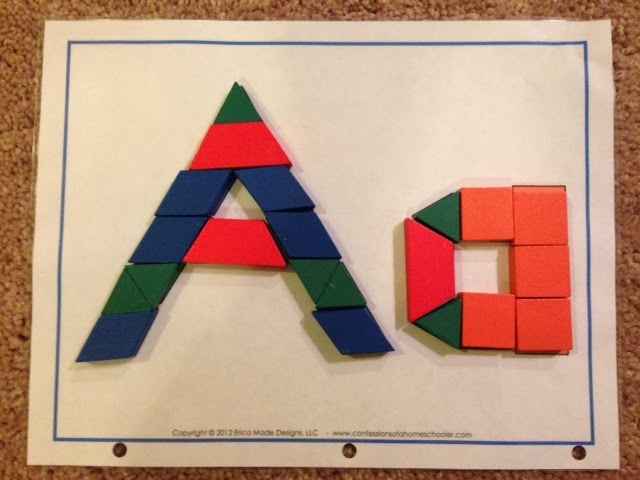 We made the letter Aa using pattern blocks! We love using patterns blocks for all sorts of things. 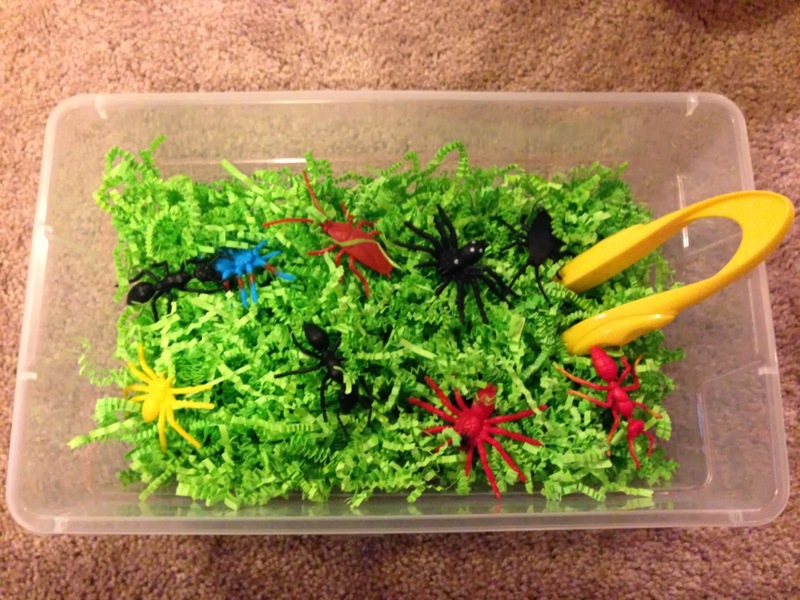 I wish more moms knew how easy these are and how much fun kids have playing with them. I purchased these on Amazon a long time ago and they are perfect! We'll even be able to use them when E studies fractions a long time from now! 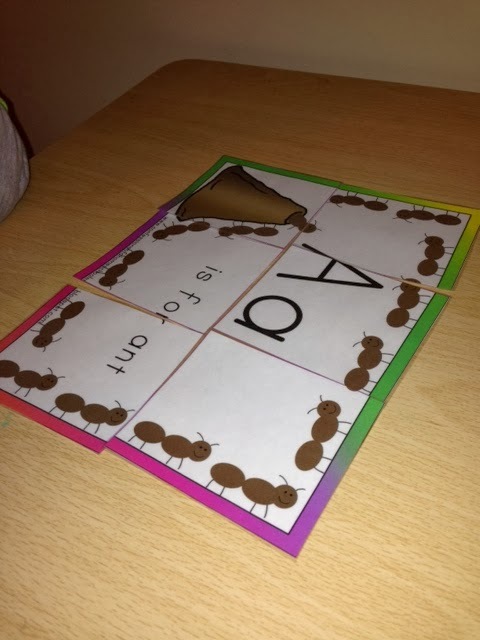 We went on a letter Aa hunt with this ant passage! E really likes to do this activity. 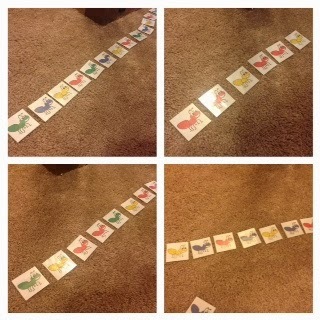 E was not a fan of this activity because it posed some difficulty, but I loved it! 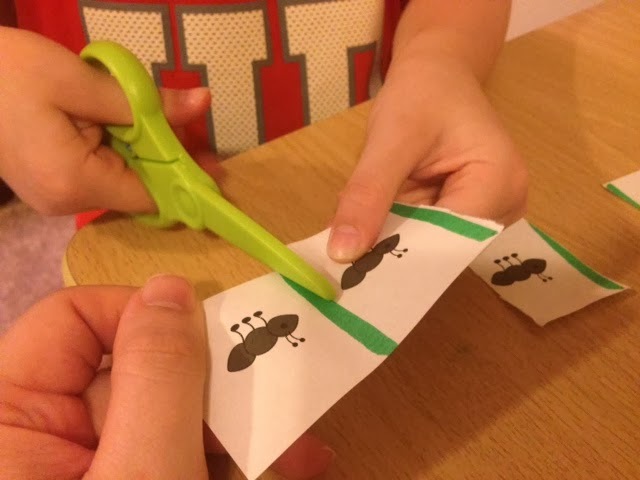 These ant counting cards reinforce counting objects, matching them to a number, AND fine motor skills by having children use clothespins with numbers on them to show how many ants there are! E has trouble with clothespins and gets frustrated easily with them. I picked these up at the Dollar General for only $1.00! 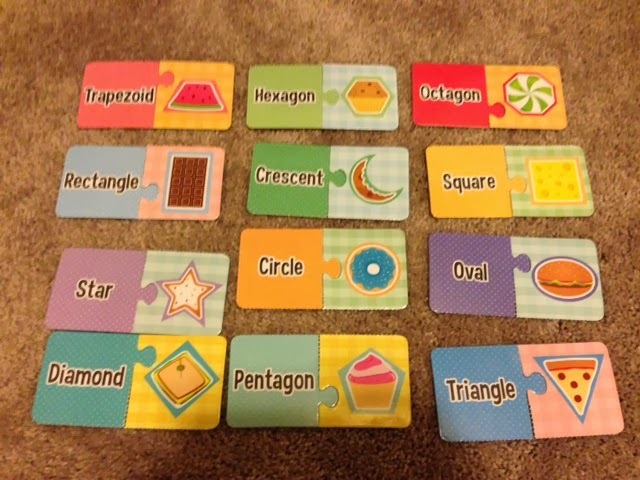 I loved that the are puzzles, they have lots of different shapes (we've never talked about trapezoids before! ), they show real life objects that are that shape, AND they were only $1.00! We have continued to have fun learning about ANTS! I'll be honest - when E first said he wanted to learn about ants, I thought, "What? Ants?" But, from the get-go, I decided I would let E pick every topic and we would just go-with-the-flow. I am so glad that I did because I've loved our ant learning!! We have continued to practice writing the letter A. We sorted ants with the letter Aa on them, uppercase and lowercase letters. 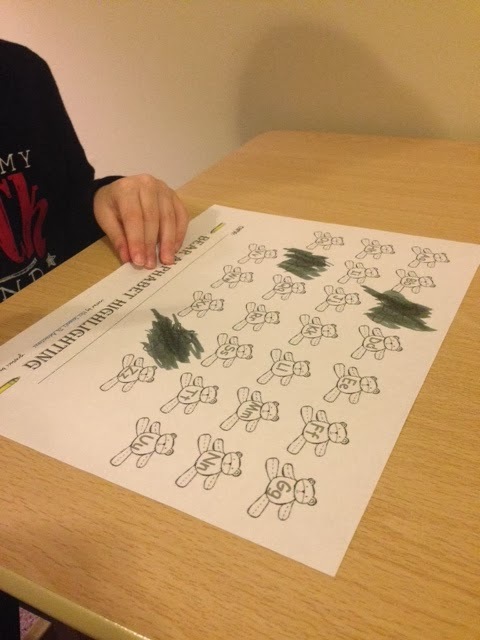 We also worked on this "Which Ant is Different?" activity. This activity posed some difficulty. 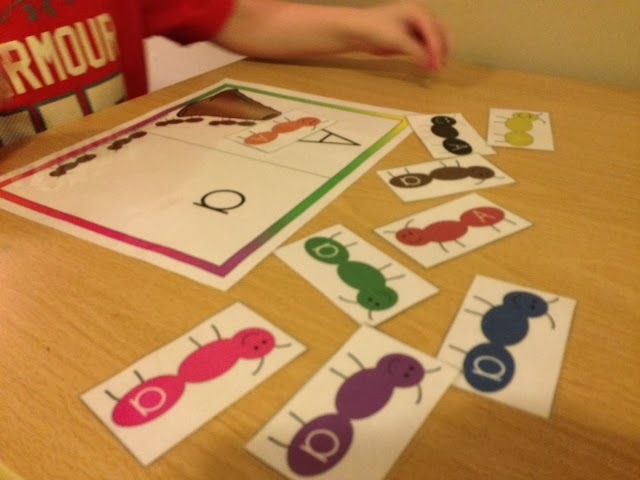 E was, for the most part, able to pick out which ants were different, but he had a hard time telling me why they were different. This is a skill we will continue to work on! 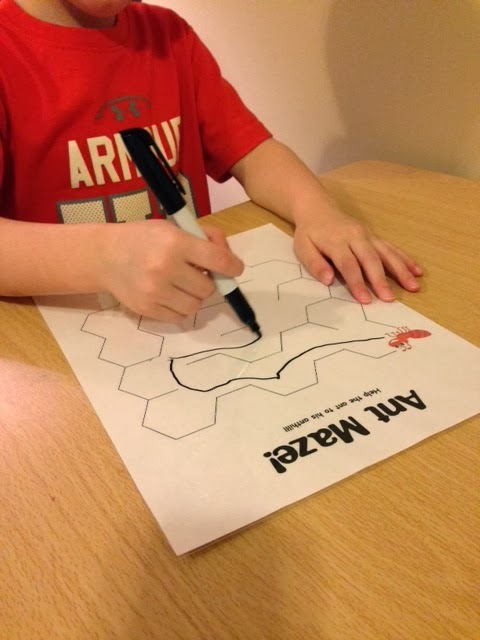 We worked on an ant puzzle and an ant maze! We played an ant game where we rolled a dice and put that # of ants on the ant hill, until all of the ants were on the ant hill. 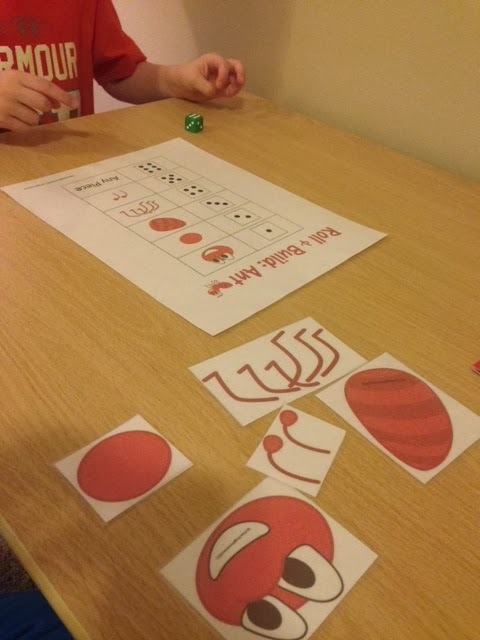 Such a simple game, but it reinforced counting and E loved it! 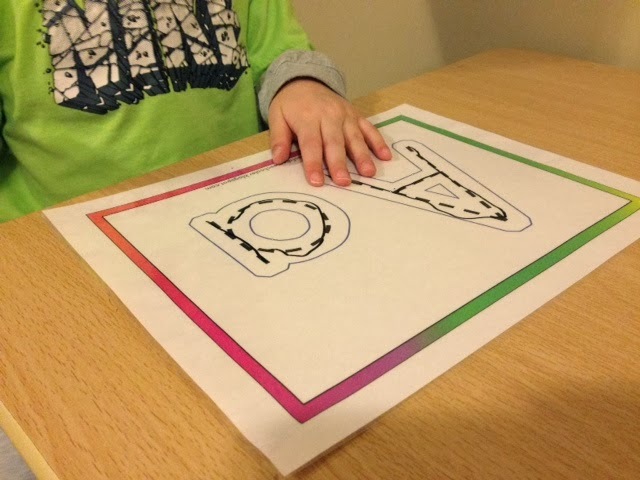 Another skill we will continue working on is cutting with scissors. I had photos of ants and I drew lines between them and had E cut along the lines. 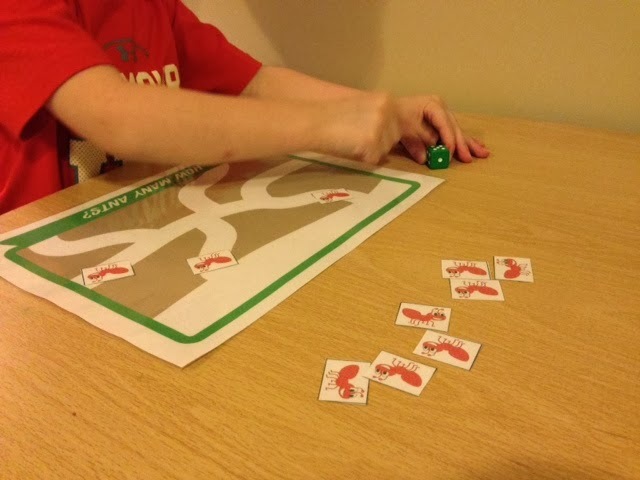 We played another game where we rolled a dice and built an ant. 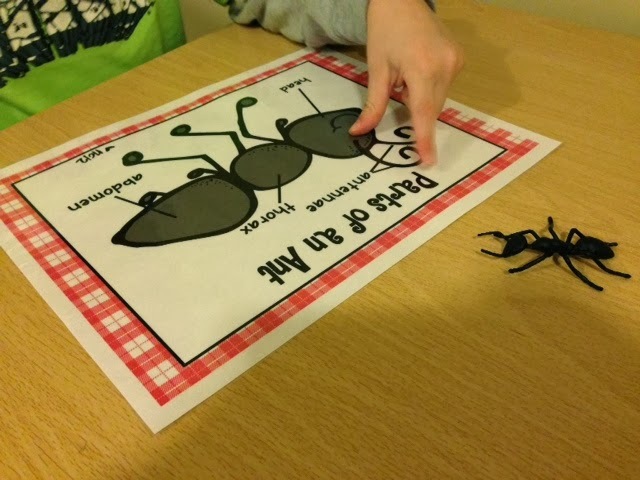 We also did this ant parts activity. Of course, I had to say the words and help him with that, but he did good with it! 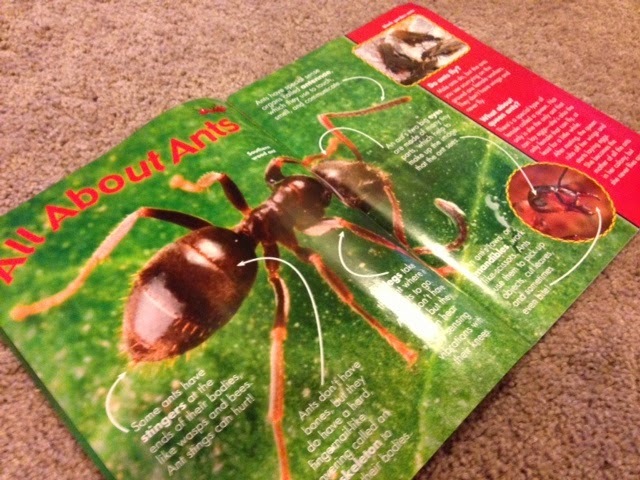 We read more of his Zootles magazine and learned about different types of ants. I just love these Zootles magazines! We also used different colored ants to make different patterns. 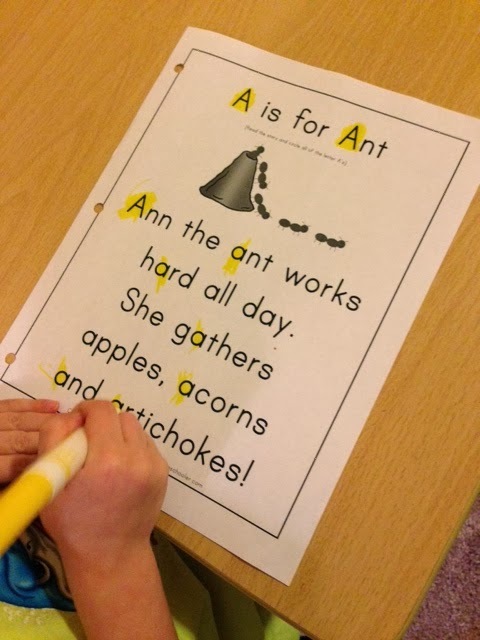 This week our focus is on the letter Aa for ANTS! 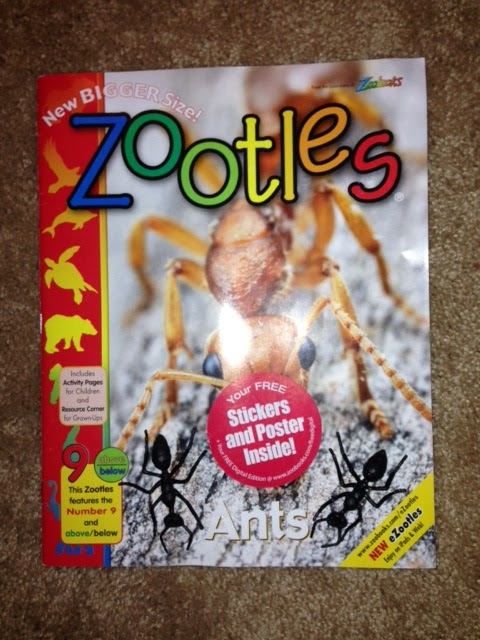 Several weeks ago I ordered E his first magazine: Zootles. You may be more familiar with the magazine Zoobooks. Zootles is the same, just for younger readers. We got his first magazine in the mail and the theme was ants! So, I am sure that's where E got the idea to learn about ants this week. I picked up a packets of critters at the Dollar Tree. 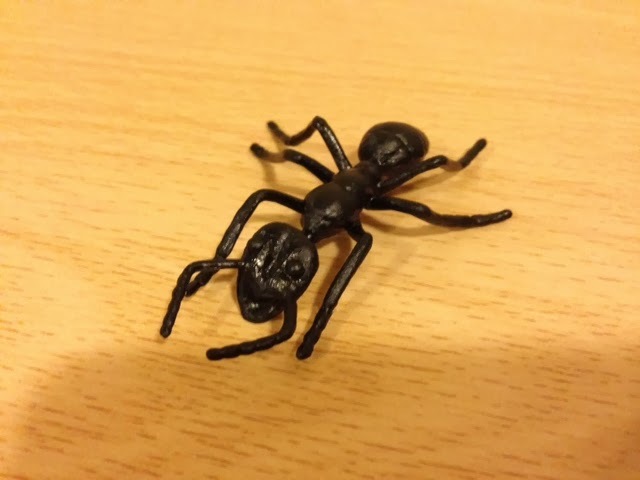 The ant inside was a good model for us to use. 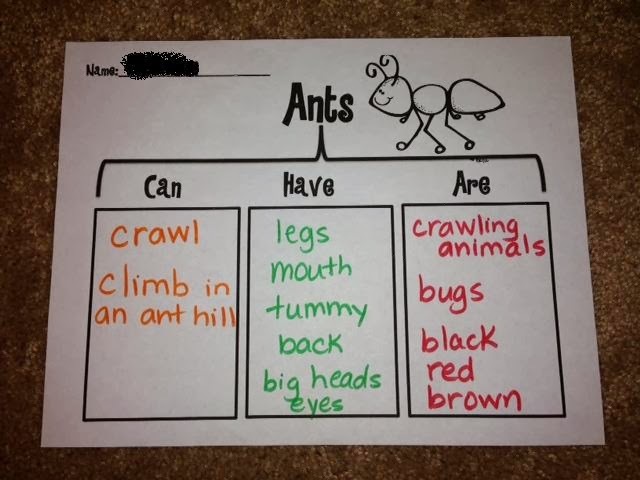 The first thing we did was make this Ant chart. E told me what to write. I like these because they give me an idea of what he already knows about a topic. 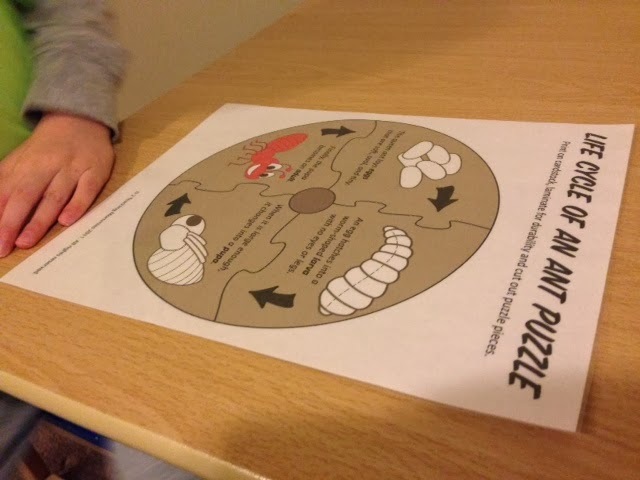 We started off completing a simple Aa is for Ant puzzle. We talked about ants in an ant hill and how we have some down the road from our house. Ick! 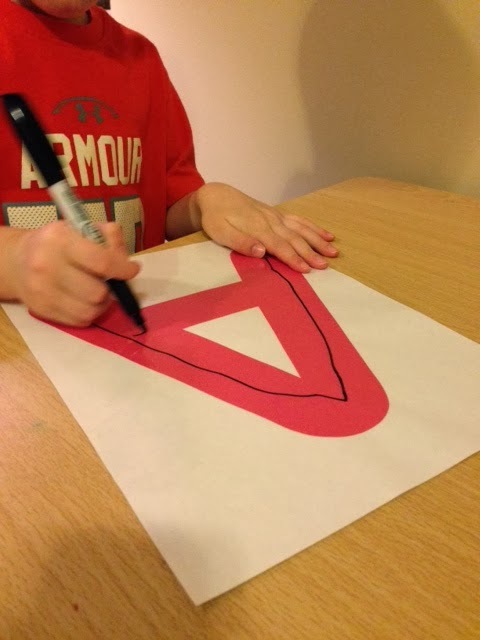 We then worked on tracing the letter A. I laminated the paper and we used a dry erase marker so we can use it over and over. 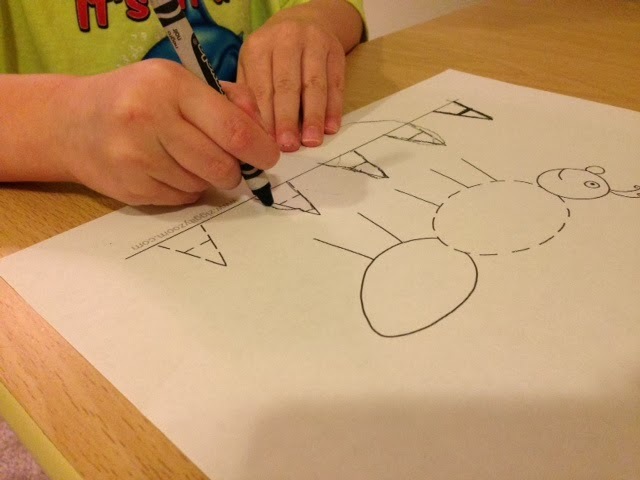 E said, "The little a is kind of like an o. But, you put the line down and that makes it an a"! 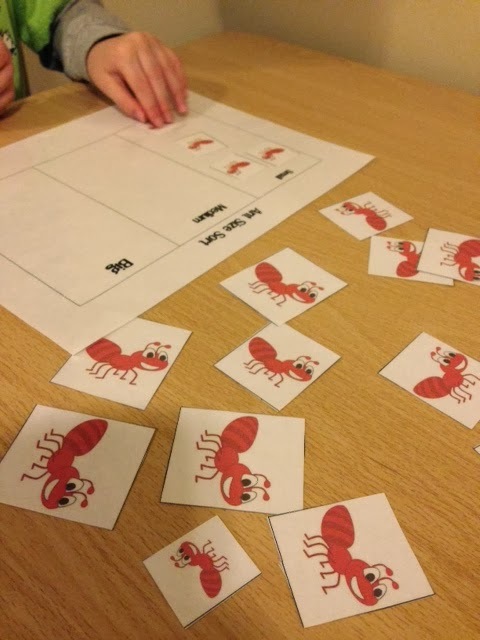 We used this this ant chart that labels the parts of an ant and we used our ant model to identify parts as well. Although he couldn't remember the words "thorax" and "abdomen", he was able to point to the right part when I said the words. We organized ants in different sizes. I liked that this chart used the word medium. E did really well with it. 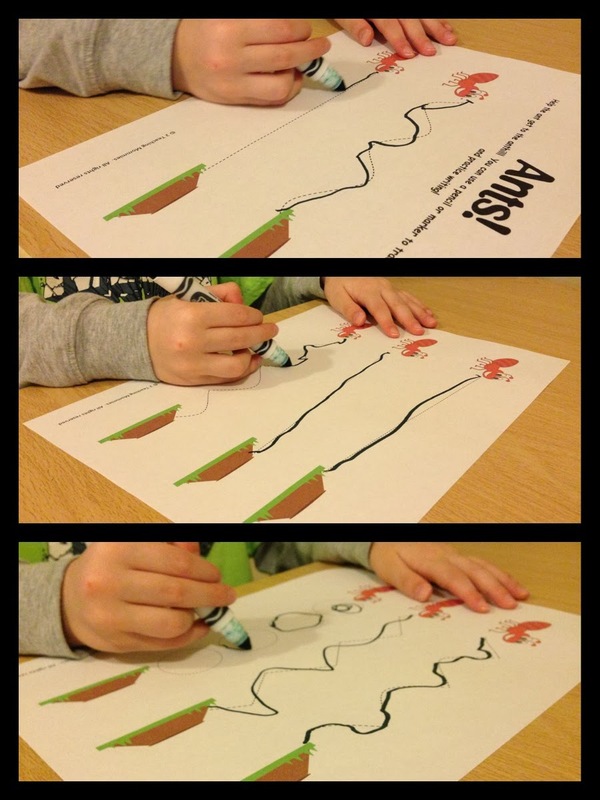 We helped the ants go to their ant hills by tracing the lines to show their paths. On the last page, the dashed lines were a bit harder. After E finished, E said they could just go a different way and he drew his own lines from the ant to the ant hill. I got so tickled at the way his mind works - like, why make it hard...just let them go like this! We talked briefly about the life cycle of an ant. I felt like it was over his head so I explained it pretty basic. Just an interesting tidbit to throw in there for him! 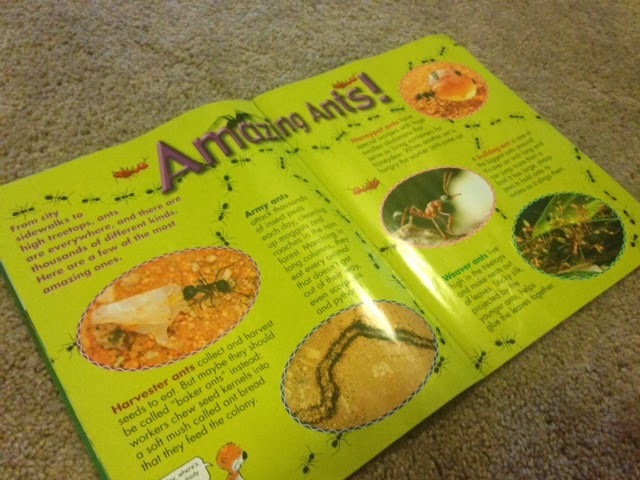 Lastly, we read a page about of his Zootles magazine and learned that male ants can fly. Who knew?! 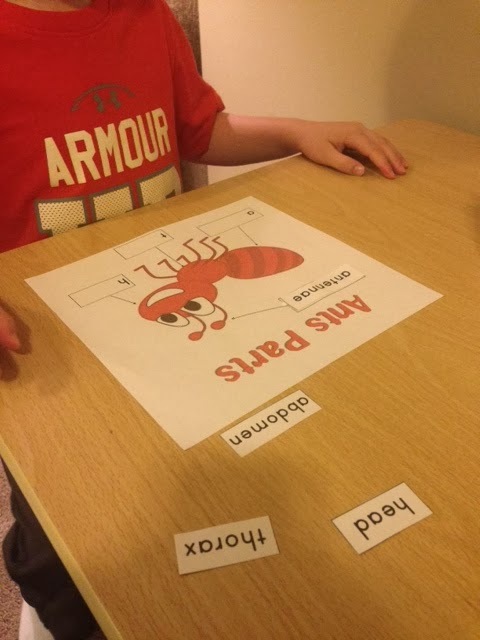 More fun letter Aa - ants activities coming later this week!